You'll be £14.99 closer to your next £10.00 credit when you purchase Isle of Thanet in the Great War. What's this? Because of the geographical location of the Isle of Thanet, it was always going to play a part in the First World War. For some wounded British and Commonwealth troops returning from the fighting in France and Belgium, it was their first sight of England in months. The Isle of Thanet just happened to be on one of the routes German Zeppelins and Gotha Bombers took on their way to try and bomb London, which meant that parts of the district were always going to be vulnerable from a sudden an unexpected attack from the air. The Isle of Thanet not only provided thousands of men for service in the armed forces, but hundreds of men and women to serve in the Voluntary Aid Detachments that were greatly needed, not just throughout the Isle of Thanet, but all over Kent, to help deal with the steady influx of returning wounded soldiers from across the English Channel. Members of local Territorial units, the 4th Battalion, The Buffs (East Kent Regiment) and the 3rd (Kent) Battalion, Royal Field Artillery, were quickly mobilized for war time service, during the early days of the war, suddenly making everything so very real for those concerned. Many of the districts Police Constables, were ex-servicemen, some of whom were still on the Army Reserve, they too were called up to once again go and serve with the colours. There was a great clamour across the country with everybody wanting to do their bit in what ever way they could, the people of the Isle of Thanet were no different. By the end of the war, they had certainly played their part in ensuring that the outcome was a victorious one, making the sadness of the ones who had paid the ultimate price, slightly easier to accept. This is a fine work and a suitable testament to the people of the area. Those looking for family history will find it in the publishing of the many names recorded on the Island's War Memorials. The author must be given credit for searching out and recording the many men of Ramsgate who lost their lives, but who are not listed individually on the town's War Memorial. 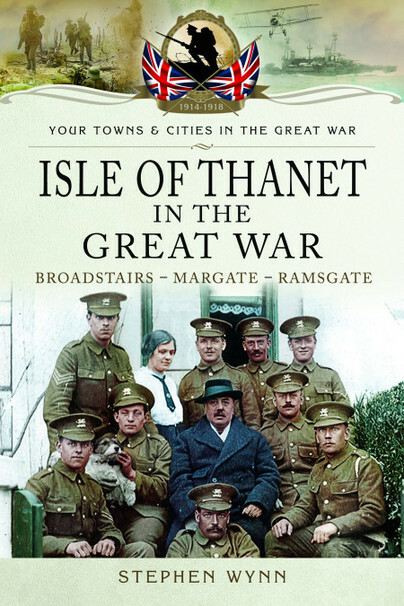 The Isle of Thanet in the Great War contains a wealth of information on how the Great War impacted on the three Thanet tows of Broadstairs, Margate and Ramsgate. It tells the story on a year-by-year basis and ends with lists of the fallen from each locations. Much of the information has been gleamed from local newspapers published at the time and the author has also picked up on a number of interesting court cases that took place during those war years. This book will appeal particularly to those who have an interest in the Great War and how it impacted on Thanet 100 years ago.